Is flossing really important if you brush your teeth every day? Well yes, it is important to floss your teeth regularly. Floss reaches in between the teeth and clears the debris. If you don't floss, the bad and harmful bacteria in your mouth accumulate in between the teeth. This accumulation of bacteria hardens and forms a substance called tartar, which cannot be removed by brushing. Over a time, the number of harmful bacteria increases within the tartar, causing swollen and bleeding gums and infection, leading to a condition known as gingivitis. If this remains untreated, it can lead to many "periodontal diseases" (diseases involving not only gums but also the bones and structures supporting the teeth). To avoid all the above, floss regularly! 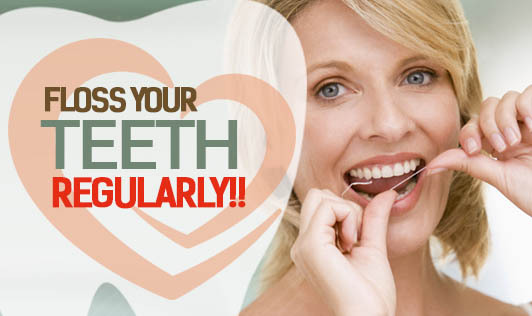 Remember, brushing and flossing teeth regularly will give you a smile for lifetime! !